Background: Accounting for approximately 5% of the bone fractures in the human body, the shaft of the humerus is one of the most common long bone fracture sites. Humerus fracture may be associated with several complications: radial nerve damage, bone infection, and non-union and mal-union of the bone. Autologous bone marrow injections are considered to decrease these complications and accelerate union and healing in non-unions. Objectives: The present study investigates the effect of autologous bone marrow injections on the union rate in humerus fractures. Patients and Methods: For this interventional clinical trial, patients with humerus fracture referred to the emergency ward of Baqiyatallah and Imam Hossein hospitals were enrolled in the study. Thirty-six patients with a mean age of 33.97 ± 10.08 years underwent analysis. Demographic information, type of fracture, para-clinical test results, and initial X-ray results were recorded on a predesigned questionnaire. Patients were randomly assigned to either bone marrow injection or cast only (non-surgical) treatment. Patients were followed up one, two, three, four, six, twelve, and sixteen weeks after injection or cast (non-surgical) therapies with lateral and anterior-posterior radiography. Details regarding union time and mal-union or non-union were recorded. Results: The mean time of union was 8.54 ± 3.41 weeks for the individuals followed in the study. On average, union took 7.04 ± 2.49 weeks for the injection group, while it took 10.41 ± 3.26 weeks for the control group (P = 0.002). In the sixth week, 16 (80%) patients from the injection group and 4 (25%) individuals from the control group had radiographic changes (P = 0.001). Union changes were seen in 19 (95%) patients from the injection group and 12 (75%) individuals from the control group at the end of the twelfth week (P = 0.108). All patients in both groups had complete union 16 weeks after their respective treatments (P = 0.31). Conclusions: Due to the high risk of non-union and mal-union in humerus shaft fracture, and because applying this simple and inexpensive technique significantly decreased these complications, injecting autologous bone marrow grafts is recommended for accelerating union in cases of humerus fracture. Accounting for approximately 5% of bone fractures in the human body, the shaft of the humerus is one of the most common sites for long bone fractures (1, 2). The definitive diagnosis of humerus fractures is usually made by radiography and most cases can be treated without surgical intervention. The most common non-surgical treatment for long bone fractures is hanging cast or arm splints. Union of humerus fractures takes several weeks or months and involves special care instructions that the patient should follow. Humerus fractures may be associated with several complications, such as radial nerve damage, bone infection, and non-union and mal-union of the bone (3, 4). About 10% of extremity fractures result in non-union or mal-union and a higher percentage end up with delayed union. The rate of non-union is estimated to be 5.5% after closed treatment of humerus shaft fractures (5). Accepting minor amounts of displacement is better than surgical intervention in which the complications overweigh the minor possible benefits. Currently, expensive mediators like prostaglandins and bone growth factors (bone morphogenetic proteins, and platelet-derived and fibroblast growth factors) are used for accelerating union and healing non-unions (6-8). These factors are assumed to act as signaling agents in cell division and differentiation of bone tissue (8). Thus, because of the high cost associated with the application of bone growth factors, the high rate of complications due to surgical intervention, and the necessity for early union in humeral fractures, finding an inexpensive method with fewer complications for earlier fracture union seems to be necessary. Injecting autologous bone marrow is an alternative method that addresses these issues and has been being used for other types of fractures in previous studies (9, 10). In the present study, we aimed to investigate the effect of injecting autologous bone marrow to the fractured humerus bone on decreasing the number of cases of delayed union and non-union and providing faster union. This interventional clinical trial was conducted between August 2012 and August 2014 in the emergency wards at Baqiyatallah hospital and Imam Hossein hospital. After being informed of the study process and possible complications, and signing informed consent, patients with humerus fractures were enrolled in the study. Demographic information, type of fracture, para-clinical test results, and X-ray results were recorded on a predesigned questionnaire. Patients greater than 65 years of age or those who had had previous surgery on the arm or indications for surgical intervention (pathologic, open or segmental fracture, floating elbow, multi-trauma patients, and new onset radial nerve palsy) were excluded from the study. Patients experiencing their first humerus fracture and those between 18 and 65 years of age with one-communition fracture were included in the study. Patients were randomly assigned to either bone marrow injection or cast only (non-surgical) treatment using a random-number table. For patients in the bone marrow injection group, an autologous bone marrow graft from the iliac bone crest on the same side as the fracture was extracted under anesthesia using a 16 no. bone marrow aspiration needle; using the same aspiration needle, 5 mL of this graft was injected into the fractured bone under image intensification by a single orthopedic surgeon in the emergency ward. Patients in both the control and injection groups were given a hanging cast on the fractured arm. Patients were followed up at one, two, three, four, six, twelve, and sixteen weeks after injection or cast (non-surgical) therapies with lateral and anterior-posterior radiography. Details regarding the union time and mal-union or non-union were recorded. Non-union was defined as no progression of bone union after 6 months. Mal-union was radiologically indicated when the site of fracture was visible and the ends had not sclerosed. Casts remained on the patients until complete union was observed on X-ray; those with non-union or deformities underwent surgical treatment. Data were analyzed using the statistical package for the social sciences (SPSS) version 16 (SPSS Inc. Chicago, IL) for windows. Frequencies, means, and standard deviations were measured for quantitative variables. Qualitative variables were expressed as percentages. The Chi square test was used to compare categorical variables. A p value of less than 0.05 was considered statistically significant. Thirty-six patients with a mean age of 33.97 ± 10.08 years underwent analysis. There was no significant difference between the two groups with regard to age (Table 1, P = 0.615). In both the injection and control groups, most cases were male. There was no significant difference between the two groups for distribution of gender (P = 0.57). Patients had a mean weight of 76.47 ± 9.42 kg in both groups. Patients in the injection group had a mean weight of 75.5 ± 8.34 kg, while the mean weight was 77.68 ± 11.05 kg in the control group. There was no significant difference between the two groups for weight distribution (P = 0.497). The mean height of the patients in both groups was 172.11 ± 8.43 cm. Patients in the injection group had a mean height of 170.9 ± 7.28 cm, while the mean height of patients in the control group was 173.62 ± 9.72 cm. There was no significant difference between the two groups with regard to height (P = 0.343). Two (10%) patients in the injection group and 1 (6.2%) patient in the control group had diabetes. Four (20%) patients in the injection group and 2 (12.5%) in the control group had hypertension. For the study subjects, the mean time of union was 8.54 ± 3.41 weeks. No changes were observed in the radiographs after two weeks. Two (10%) patients in the injection group showed bone callus formation after 4 weeks (P = 0.302). In the sixth week, 16 (80%) patients in the injection group and 4 (25%) individuals in the control group had radiographic changes (P = 0.001). Union changes were seen in 19 (95%) patients in the injection group and 12 (75%) patients in the control group at the end of the twelfth week (P = 0.108). All patients in both groups had complete union 16 weeks after their respective treatments (P = 0.31). On average, union took 7.04 ± 2.49 weeks for the injection group, while it took 10.41 ± 3.26 weeks in the control group. Patients in the injection group had a significantly faster union time compared to patients in the control group (P = 0.002). One (6.25%) patient in the control group had a non-union complication after 12 weeks and subsequently underwent surgical treatment; no patients in the injection group experienced non-union (P = 0.076). In addition, 1 (6.25%) patient in the control group had bone angulation in the fourth week and subsequently underwent open reduction internal fixation (ORIF), while no patients in the injection group experienced mal-union complications (P = 0.444). We found that injecting autologous iliac crest bone marrow into the fractured bone significantly decreased the union time and incidence of non-union complications when compared to the control group. Cadet et al. (5) reported that open reduction and internal fixation with compression plating and bone graft are standards of care in treating humeral shaft non-unions and provides a union rate of greater than 90%. Previous studies mention a variety of modalities for managing and decreasing complications in humerus and long bone shaft fractures. Some suggest grafts and some suggest bone marrow injections for treating non-union and mal-union of fractures. Autologous bone marrow accelerates healing as a stimulator of mesenchymal cells (osteo-induction) and as a space filling agent (osteo-conduction) (9). Sen et al. (11), in a review article comparing iliac crest bone graft (ICBG) with other methods of treating non-union, concluded that ICBG the only clinically available graft source that contains viable precursor cells is the gold standard for treating non-unions. They also mention that there is no clinical evidence for greater effectiveness or superiority in other modalities such as ceramics, platelet-rich plasma, or bone morphogenetic proteins (BMPs). Flierl et al. (12), in a prospective study assessing the complication rate of different bone grafting modalities in the management of long bone non-unions, conclude that bone autograft is the most efficacious modality in the treatment of non-unions when compared to allograft, BMP, and allograft/autograft combination methods. They show that the autograft modality results in less time to union need for revision surgery and postoperative infection compared to other methods. Shrivastav et al. (13) conclude that autologous bone marrow injection is an effective method for managing non-union or delayed union of long bone fractures, which is in agreement with the present study. They also mention that a combination of marrow with osteoinductive and osteoconductive materials may greatly decrease the need for operative grafting in delayed and non-union bone healing. After evaluating patients with delayed or non-union of bone fractures, Singh et al. conclude that multiple injections of low-volume bone marrow are useful for treating these conditions (10). Eapen et al. (14) assessed the effect of bone marrow injection on treating non-union fractures in 34 patients. In this study, patients with no clinical or radiological signs of union were selected and aspirated bone marrow from the iliac crest was injected into the fracture site. 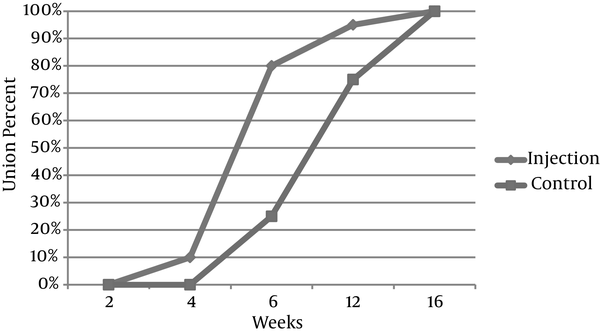 After following patients at 6 weeks, 12 weeks and 6 months, a union rate of 72% was recorded. The authors mention that this method is safe, economical, and technically easy for use in the healing of bone fractures. Due to the high risk of non-union and mal-union in humerus shaft fractures reported by previous studies and because applying this simple and inexpensive technique has resulted in earlier union, the injection of autologous bone marrow is recommended for accelerating union in humerus fractures. Further studies are suggested to investigate the effectiveness of this technique with a larger sample size and in fractures of other long bones. Authors’ Contribution: Alireza Rahimnia designed the study and collected the data. Ahmad Dorostgan collected the data and drafted the manuscript. Gholam Hossein Kazemian collected the data and revised the manuscript. Amirhossein Rahimnia analyzed the data and drafted the manuscript.